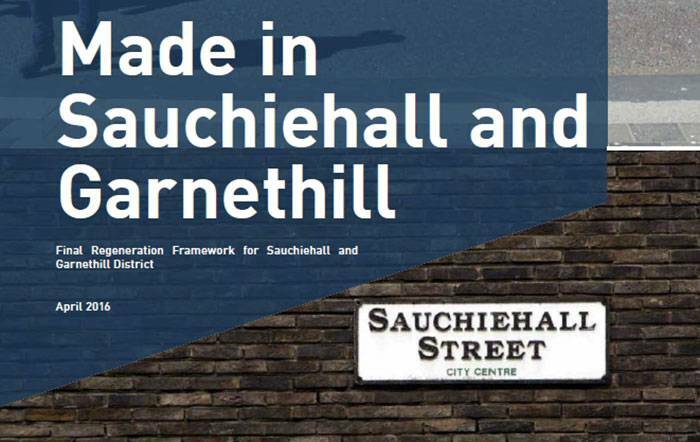 The City Council’s Executive Committee has today approved the final version of the Sauchiehall and Garnethill District Regeneration Framework. The draft Regeneration Framework was produced after extensive engagement during 2015 by consultants Gehl Architects and Nick Wright Planning on behalf of the City Council. At the end of 2015 and early 2016, the Council undertook a formal consultation on the draft Regeneration Framework. There was overwhelming public support for all of the projects in the Regeneration Framework, as explained in the report [240kb PDF] presented to the Executive Committee on 26 May 2016. During the formal consultation, a number of suggestions were made about the draft Regeneration Framework. The Council has responded by making a number of refinements to the draft, including improvements to maps, updated monitoring and evaluation arrangements and an expanded planning policy section. A short summary [6.3mb PDF] of the Regeneration Framework has also been produced. This is also available in Simplified Chinese and in Traditional Chinese. It includes an action programme and timeline for delivery of the projects in the Regeneration Framework between now and 2023. If you’re interested to find out what will happen when, look at the table on page 13 of the summary. A big thank you to all of those who gave their time to help prepare the Regeneration Framework. We’re really pleased that it has now been approved by the Council – and we’ve already started work on the hard work of delivering the action plan!